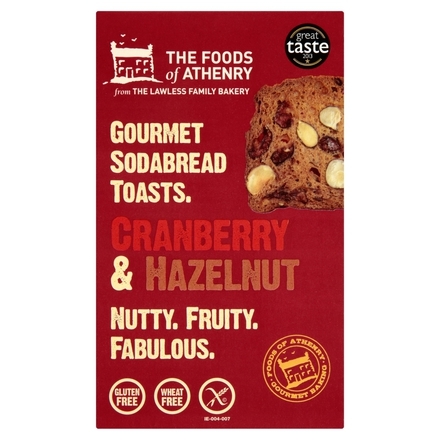 Cranberry & Hazelnut Toasts 110g (The Foods Of Athenry) - HealthySupplies.co.uk. Buy Online. Nutty and fruity soda bread crackers. Works well with both sweet and savoury toppings. Made with wholegrain organic Piedmontese brown rice. Gluten free flour (rice, potato, maize, buckwheat, tapioca), Buttermilk, Cranberries (14%), Hazelnuts (9%), Brown Sugar, Treacle, Raising Agents (Mono calcium phosphate, sodium bicarbonate), Stabiliser: Xanthum gum, Salt. Guaranteed gluten-free • Wheat-free • Vegetarian.